Two Dundee-based aviation students have completed a cross-country trip a part of their pilot degree. 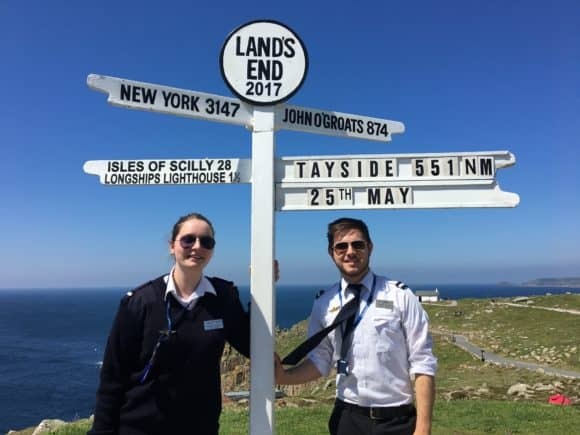 Mairi Lewis from Glasgow and Edinburgh-born Scott Cruickshank, both aged 21, are nearing the end of their degree, which is run by Dundee-based flying school and aircraft engineering company Tayside Aviation in conjunction with Middlesex University and Aviation Skills Partnership. The BSc (Hons) Professional Aviation Pilot Practice programme, the first of its kind available in Scotland, greatly accelerates students’ chances of gaining gaining employment as an airline pilot in what is a highly competitive industry. Over 30 students are currently undertaking the three-year course, with the first batch due to be placed with an airline in November 2017. The course includes 100 hours of hours building so the high-flying duo decided to go as far as they could! Having now progressed to the Instrument Ratings element of their course, Mairi and Scott hope to have completed all training by the end of the year and graduate in Autumn 2018. Tayside Aviation worked with the Aviation Skills Partnership, Middlesex University and Loganair to achieve validation for the work-based modular course, which will enhance students’ career progression within the industry and hopefully attract more females into the career who currently represent less than 10% of the UK’s commercial pilot cohort. Jim Watt, Managing Director, Tayside Aviation said, “It is unusual for students to travel so far but it’s a fantastic experience as they have to plan for differing weather conditions. Typically, the degree students will travel 400 nautical miles to qualify”. Students embarking on the degree not only require academic criteria similar to most degree courses but also a Private Pilot Licence (PPL), proving their aptitude, ability and work ethic from the outset. The first batch of students began their course in January 2015, with new intakes every six months (April and October). Tayside Aviation run regular monthly open days to provide information and course overviews. Please visit www.taysideaviation.co.uk for more information, or telephone (01382) 644372.